When installing an island in your kitchen, there is no “one size fits all” solution. You have the ability to control every detail – from how tall it is to the size and shape. This freedom provides you with a world of possibilities but when you’re designing something from scratch, sometimes it’s hard to know just where to start. Here are a few things to consider when designing your ideal kitchen island. An island can fill many roles in the kitchen. It can serve as an additional seating area, a prep space with added storage, an entertaining spot, and more. Deciding what tasks you primarily intend to use your island for will affect what features you should include in its design. Or maybe you want a multi-tasking space with plenty of room. On any home design project, it’s best to try and be as realistic as possible when thinking about how you plan to use the space. You could design the perfect kitchen island for entertaining guests, but if you rarely host events in your home and instead use your island every day for afternoon snacks and homework, you might later find yourself wishing you had chosen a different layout. Take the size and layout of your kitchen into consideration. If your kitchen is small and lacking on storage space, an island can provide you with lots of needed cabinet space. Another option is to use the island to house appliances, such as your sink and dishwasher. If you plan to use the island as a prep space and the refrigerator isn’t nearby, you may want to place a small fridge under the island for easy access while cooking. You’ll also want a few convenient storage areas for keeping utensils and cutting boards handy. When working in the kitchen, you need plenty of space to move freely. The last thing you want is for the island to hinder the room’s flow and function. Allow at least 3 feet on each end of the island, with ample space between the island and your countertops for people to pass by each other. Islands generally are 42 to 60 inches long, anything shorter can diminish an island’s practicality. No matter what you intend to use your kitchen island for, you will need good lighting. 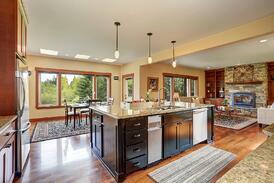 Hanging light fixtures placed directly over the island is a popular option. However, natural lighting is important to consider as well. Placing motorized window shades on your kitchen windows gives you the option to control and adjust how much light comes in, depending on the time of day or what project you are using your island for. Thinking about putting window shades in your kitchen? Polar Shades can schedule your free, in-home consultation – all you have to do is call 702-260-6110 and find out why Southern Nevada residences have trusted Polar Shades with their window treatments for over 30 years.